The rings of Saturn are the most intricate planetary decorations in our solar system, but are also cosmic gems festooned with unknown red material and some tricky dynamic forces that shape them. 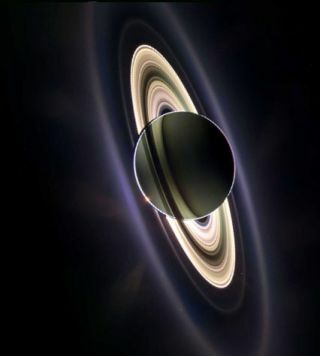 The Cassini probe has been studying the gas giant Saturn since its arrival at the gas giant in June 2004. Over that time, Cassini has studied not only Saturn's awe-inspiring rings, but also its atmosphere, moons and the magnetic shield that surrounds it. The discoveries that Cassini has made in its six years of close Saturn inspection, as well as the many mysteries of the planet left to solve, are detailed by mission scientists in two papers in the March 19 issue of the journal Science. Viewed from Earth, Saturn's rings look like a flat, stable and pristine halo around the planet, but Cassini's observations showed that this was anything but the case. With Cassini the rings "went from like a very beautiful cardboard cutout ? to a real 3D structure," said Jeff Cuzzi, Cassini's interdisciplinary scientist for rings and dust based at NASA Ames Research Center in Moffett Field, Calif. And that 3D structure was "one that is also very fluid, very variable, you know, changing as we watch it," he added. One aspect of the rings that Cassini has shed light on is their color and composition. Scientists had long known that around 90 percent of the material in the rings was water ice, but until Cassini, "it really wasn't that appreciated, I think, that how colored they are," Cuzzi told SPACE.com. Water ice is, of course, white in color, but Saturn's rings when viewed by Cassini are red ? the hue caused by some unknown contaminant. Scientists had originally thought that the red color might have come from some icy object from the outer solar system that might have veered towards Saturn and been ripped apart by the gas giant's gravitational pulls. But the signature of the red didn't match that potential source, Cuzzi said. The signature of the red material is similar to the red signatures of Saturn's moons "but still redder," Cuzzi said. Explanations now being floated by scientists include rust or small organic molecules mixed in with the water ice. Cassini also revealed that Saturn's rings are a rough and tumble place, with perturbations to their structures caused by mysterious rocketing objects, the pull of moons and their own internal dynamics. Cuzzi says that "maybe the most dramatic" perturbation is the one that occurs in the F ring ? a system of narrow strands that that lies outside of the main rings. Cassini found that kilometer-sized objects "go ricocheting back-and-forth across the F ring," Cuzzi said. Cassini first detected one of these objects just faintly, but when it saw the object again, outside of the ring, it had a long, comet-like tail. The next viewing of it was inside the ring, where the tail got even longer before the whole thing vanished completely, likely because the debris became hard to distinguish from the background of the ring. Scientists noticed that the object created a "spike" in the F ring, and were able to see dozens upon dozens more of these signatures, suggesting that "there must be dozens or hundreds of these things all doing the same thing, rocketing back and forth" through the ring. But just what these object are and how they get flung around so violently is still a mystery. Cassini has also discovered details of the interaction of the rings with Saturn's moons, as well as clumps in the rings that occur because of the ring's own gravity. A better understanding of the processes that shape the rings could help planetary scientists understand how planets form, as the ring system around Saturn has proven to be very similar to the disks of gas and dust that form around stars that are thought to give rise to planets. For example, moonlets around Saturn clear out gaps in between the rings, a process that is thought to be the same for gas giants clearing out space in a planetary nebula. "So to have this giant dynamical laboratory, which is kind of what the rings are, we can just watch these processes kind of happening right before our eyes," Cuzzi said. Cassini also probed Saturn's magnetosphere ?the shield that forms around planets when solar winds interact with the planet's magnetic field. Before Cassini?s mission, it was thought that Saturn's magnetosphere would be dominated by nitrogen shed from the moon Titan. But the spacecraft's observations showed that it is dominated by water, part of which comes from water vapor plumes that shoot out of geysers on the surface of Saturn's moon Enceladus. "The big news is that Saturn's space environment is swimming in water," said Tamas Gombosi, a Cassini scientist at the University of Michigan in Ann Arbor. Cassini found that "Enceladus produces about 100 kilograms of water vapor a second," Gombosi told SPACE.com. (100 kg is about 200 pounds). Cassini has also listened to lightning storms on Saturn, took the first movie of its auroras and observed unusual hexagon-shaped storms that persist at the planet's poles, and which scientists still haven't been able to explain. The probe has also found an enormous ring so large it is 12.5 times the distance between the Earth and the Moon, and 6 times as thick. Cassini's mission has been extended through 2017, which would more than double the time the spacecraft has spent around the ringed giant so far. Cuzzi and Gombosi both hope that further Cassini observations will help scientists piece together some of the many questions about Saturn that remain ? many of which were raised by the observations of Cassini. Particularly exciting is the prospect of watch Saturn progress through another season ? the Saturnian year is 30 years ? and watching the changes that occur in the rings, on the planet itself, and on its moons. "As long as the spacecraft stays healthy, we've got plenty of things we can do to continue to study this really interesting system and watch it change," Cuzzi said.